Yup. 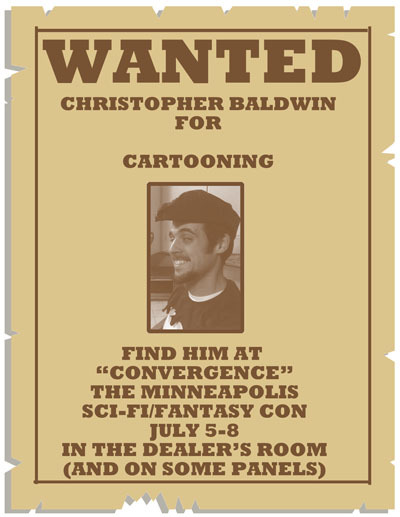 I’ll be at Convergence in Minneapolis this weekend. Click on this link to find out more details. fyi, it’s “grisly”, not “grizzly”. I’ll leave my spelling pedantry at that 🙂 Very much a fan, keep up the good work! As for the poor larper … “come get me out of here right now or I be using your name really loud over the intercom REALLY soon!” of course then he’s gonna realize that if he doesn’t do in the Bollycks then he’s a liability to Norg … so hang up and sic’em on Norg when he comes trying to keep him quiet and use the diversion to escape? That should have gone after Seth’s post. Those Bollix are about to learn the horror of latex allergy. Aw, I thought we’d have more nerd jokes. Instead they’re all dead. Oh, well. Awesome, I’m so glad you’re coming back to CONvergence (Nerdi Gras) this year! It was fun to meet you last year, my wife and I played a game of Betrayal at House on the Hill with you and our mutual friend Hedgie. See you there! Hopefully I can get to Convergence and act like a dork. It’s what I do best. 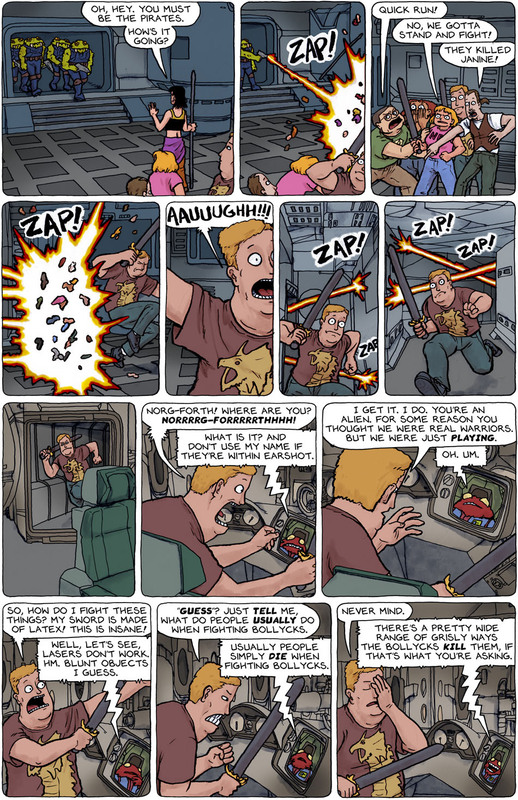 Man, I know James’ prize is supposed to involve getting killed in the comic, but now I want to see him survive this! Yes! Vote to save James! I admit I didn’t want to see this. I don’t find it funny. It is still done well and I think I know why, these are the guys that failed. The other one that didn’t work out. Sorry this is more of a downer to me. On top of that the only two females are blasted away first. Bummer squared. But I assume they are just to show us the probable real thing that would have happened to them. Or better yet when all the wrong choices are made. Wait. Today is wednesday!? Eek. Um. I’m in a van. In Montanna. Strip up tomorrow. Long story. But I’m alive and will be at Convergence Con. If you’re near White Sulphur, drop on by.